The ESA blog post Listening to an Alien Landing describes the plan to monitor a UHF beacon transmitted by Schiaparelli during it's upcoming descent and landing on Mars (2016-10-19 about 14:45 UT). 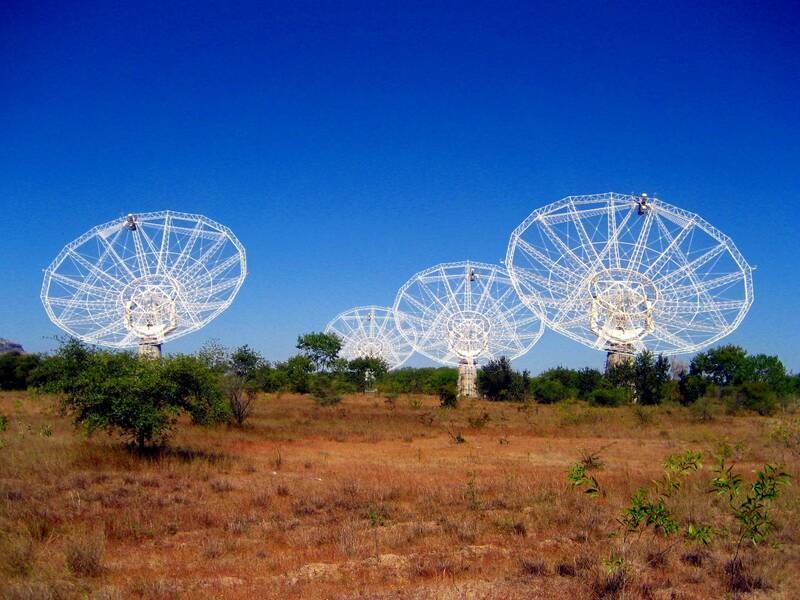 The signal will be weak, and so 28 dishes of the Giant Metrewave Radio Telescope (GMRT) will be used to listen (read more here). According to the article it was specially fitted with JPL equipment in order to optimize detection of the spacecraft beacon, and relay it live to the ESA. Is the GMRT the only instrument that is suited for this or just the most convenient? Was the spacecraft landing time chosen so that the GMRT would be optimally located to receive the beacon? above x2: Photo of a few of the central dishes in the GMRT array, from here. 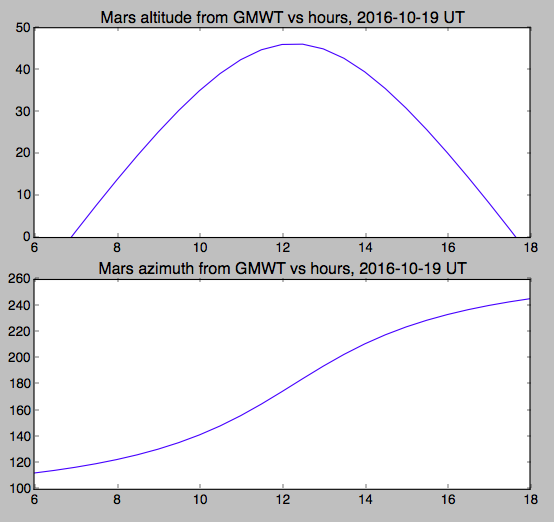 above: altiude and azimuth of Mars as seen from the GMRT in Pune, India calculated using Skyfield note: the light time delay is about 10 minutes. The landing time is determined by the interplanetary trajectory, largely fixed by launch energy constraints, and then by the landing site location, mainly the longitude. This paper identifies the landing site selection criteria, which were almost entirely about the safety of the landing. And appropriately so for an EDL demonstration mission. The landing site selected, Meridiani Planum, is the safest landing site on Mars that we have ever examined, and is where Opportunity landed and continues to operate today. Some consideration was given to the post-landing science potential, for which Meridiani is also a very good choice. Given those choices, which antennas on Earth can see Mars during the few minutes of EDL is then a matter of chance. GMRT is an incredible resource for acquiring UHF data from Mars. Its impressive total aperture provided a much higher high signal-to-noise ratio carrier, as well as the Doppler signature, than we have ever seen before on UHF using the Parkes or Green Bank antennas. However the primary means to monitor the EDM entry, descent, and landing was the relay radio on TGO itself, and it is that telemetry that is providing the most insight into what happened to the EDM. Having GMRT in view of the landing was not a requirement or a factor in the landing site selection. The use of GMRT was a first-time experiment conducted by JPL (we didn't even know if it would work), which ESA called a "a 'nice-to-have' to allow us to watch the descent in real time". As it turned out, it was very nice to have, providing quite clear, real-time information that could not be obtained from TGO. The data from TGO was returned a few hours after landing and orbit insertion. Not the answer you're looking for? Browse other questions tagged data-transmission radio-telescope skyfield exomars schiaparelli-lander or ask your own question. Were the previous Mars landers configured to transmit beacons or data during descent?